Project X Zone Characters and Screenshots. Not too long after the reveal, Famitsu released character art and screenshots for Capcom/Namco/Sega collaboration Project X Zone. 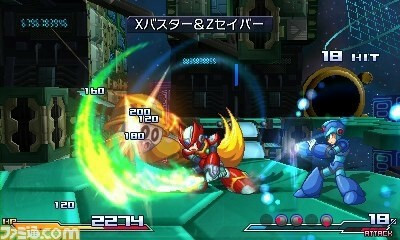 The game is a strategy RPG much like its predecessor, Namco X Capcom. That character roster might seem paltry now, but of Namco X Capcom is anything to go by, this is is going to grow by a huge margin. So far not exact date is set, but the trio’s aiming for a late 2012 release. Characters and art after the jump. This entry was posted in Gaming News and tagged .hack, 3ds, akira, black rose, Capcom, chisa, Chris Redfield, cyrille, Dante, Darkstalkers, Devil may cry, dimitri, estelle, ichiro, Jill Valentine, jin kazama, ken, kite, kos-mos, kurt, mega man x, namco, pai chan, project x zone, resident evil, ryu, sakura wars, sanger, sega, shining force exa, space channel 5, Street Fighter, super robot wars, tales of vesperia, tekken, touma, ulala, valkyria chronicles III, vurtua fighter, xenosaga, yuri, zeo on April 12, 2012 by Steven T..